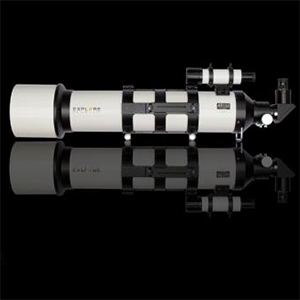 The Explore Scientific AR152 152 mm f/6.5 Air-Spaced Doublet is an excellent 6-inch class achromatic refracting telescope with push-pull collimatable lens cell, 2-inch heavy duty Crayford-sytle two speed focuser, good quality 8x50mm straight through finderscope, mounting rings with handle and univsersal Vixen/Synta profile dovetail plate and a 2-inch 99% Reflective Mirror Diagonal with 1.25 " step down adapter. • Two-Speed Focuser 2.0" I.D. • Optical Tube Assembly Weight (with all standard accessories): 23.5 lbs; - 10.7 kgs.